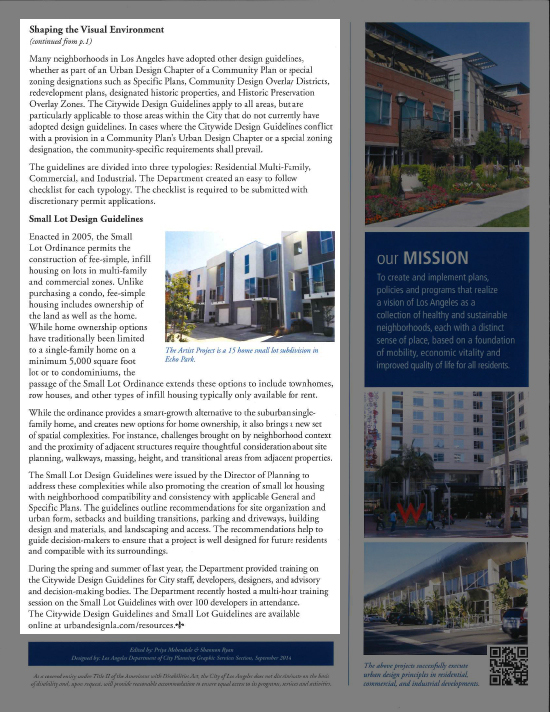 Modative has been featured in a couple of recent articles: one in the Los Angeles Business Journal and another in Architect Magazine. Yay us! Check them out below. 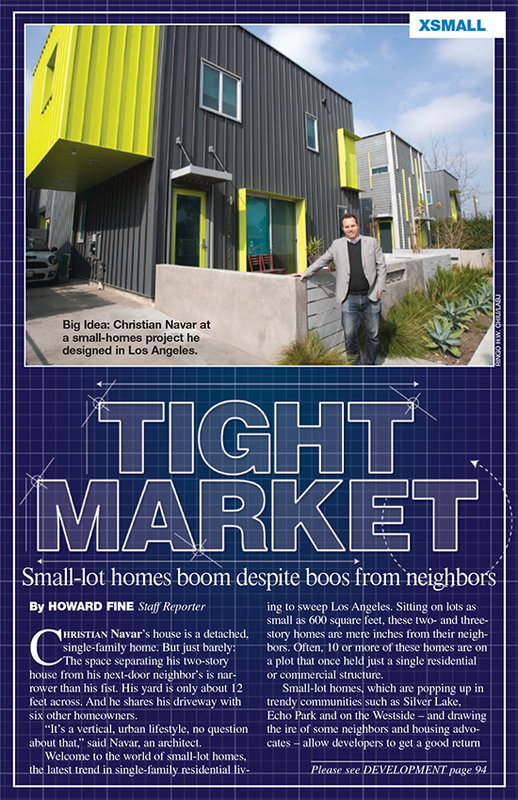 Modative featured in Los Angeles Business Journal cover story titled "Tight Market". Christian Návar in front of the Fay 3x Homes, designed and built by Modative. Fay 2x Homes and Fay Phase III are visible in the background. Posted February 1 to Architect Magazine's website, an article titled "Time Management" looks at the techniques managers employ to stay organized. Christian Návar, principal and co-founder of Modative, speaks about the processes in place at Modative to encourage employees to work efficiently. 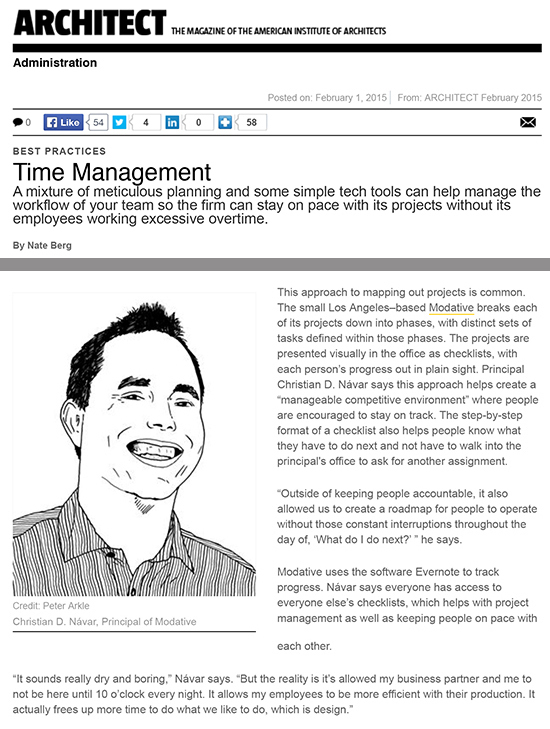 Exerpt of Architect Magazine article titled "Time Management", for which Modative was interviewed. 2014 was an eventful year for Modative. Two projects were completed, construction began on six projects (two of which are Modative Build projects), and five projects are currently in the entitlement process. 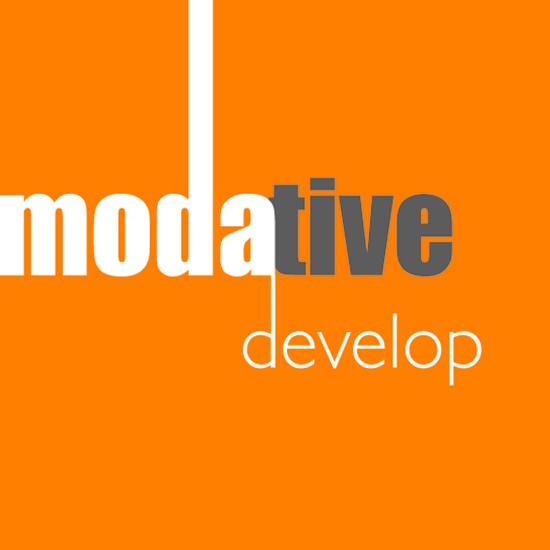 2014 also saw the birth of Modative founders’ third company: Modative Development. 2015 is going to be a big year! 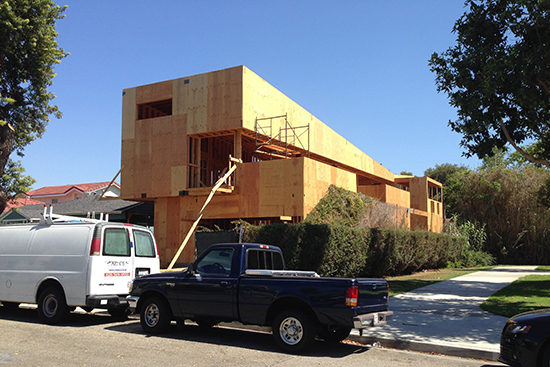 Construction continues for Modative Build at our West-Hollywood-adjacent, 5-home small lot subdivision project. 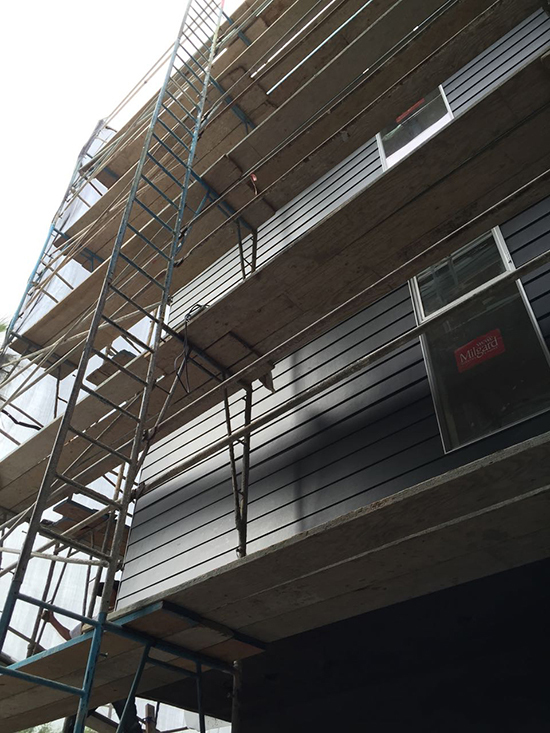 This week, we are applying the 3-coat stucco and continuting with interior finishes. 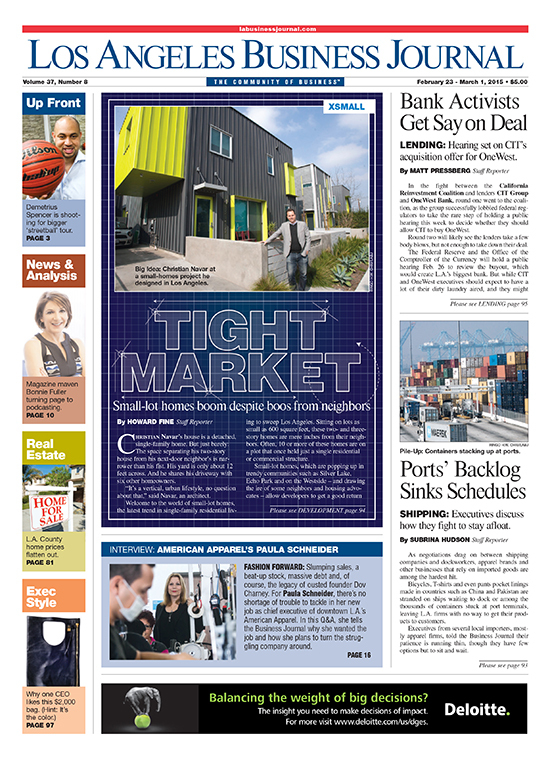 Construction is slated to be complete the first quarter of 2015. 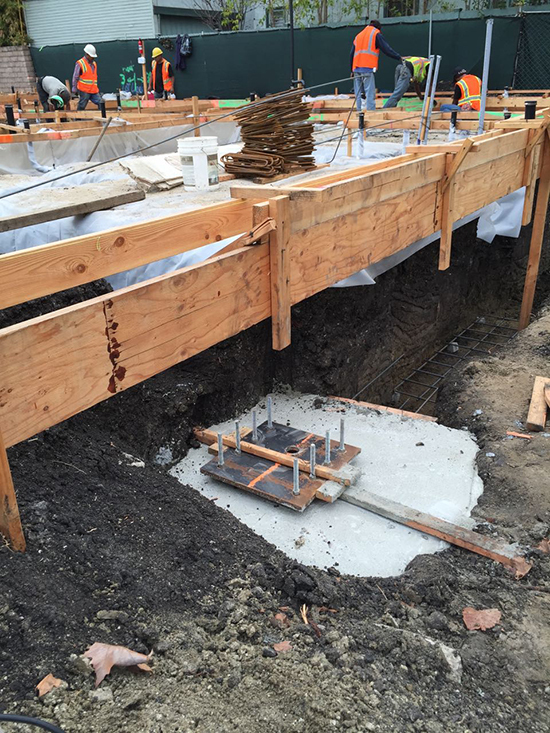 As you may have read in a past blog post, construction began on this 3,600 square foot single-family home in Culver City in 2012 then stopped after the slab was poured. But, in 2014, it went vertical. It is now fully framed and is scheduled to be finished the second quarter of 2015. This project has been in our office in one form or another for nearly 7 years. 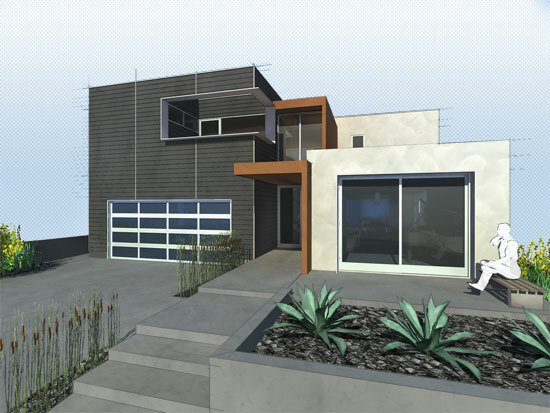 It was originally conceived as a 7-home small lot subdivision project. Due to delays caused by a down economy, it was built in 3 separate stages. The third and final phase was completed in October of 2014. 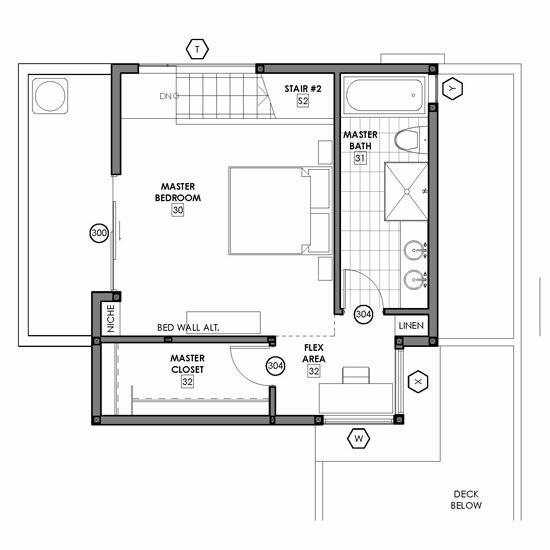 All phases were constructed by Modative Build. 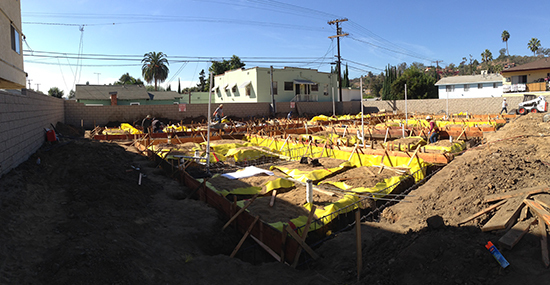 This 3-home small lot subdivision in Palms, a stone's throw from downtown Culver City, began construction around the same time as our Bento Box project. We're in a friendly race to see which project will finish first. 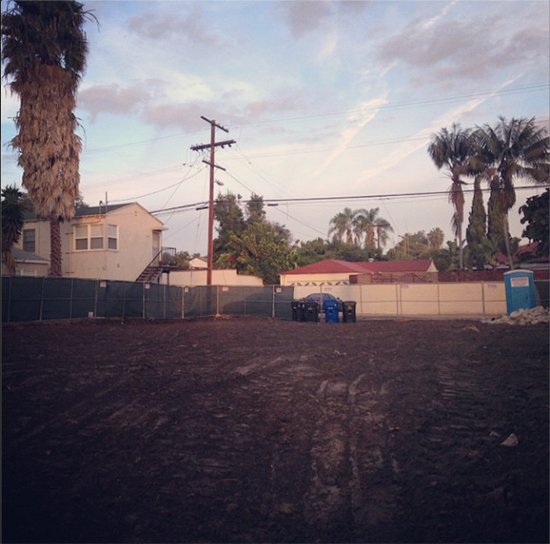 This 10-home small lot subdivision project is located just northwest of La Brea and Melrose and began construction in December of 2014. 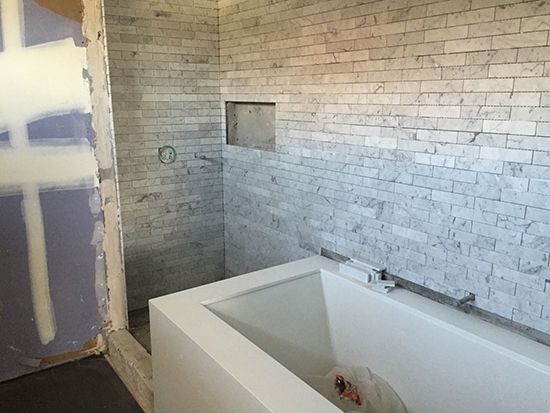 Modative Build began construcion on this 4-home small lot subdivision project in December of 2014. 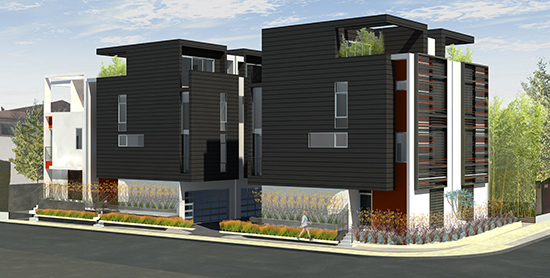 These homes are located just north of Santa Monica Airport on Ocean Park Blvd. and took inspiration from the aircraft hangars once located nearby. 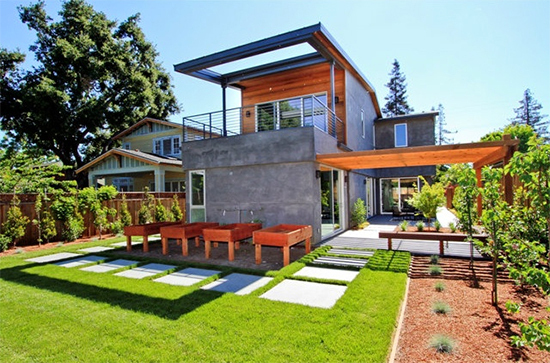 This 2,400 square foot single-family residence, located in Mountain View, CA, was completed in March of 2014. This home sold for $2.35 million. 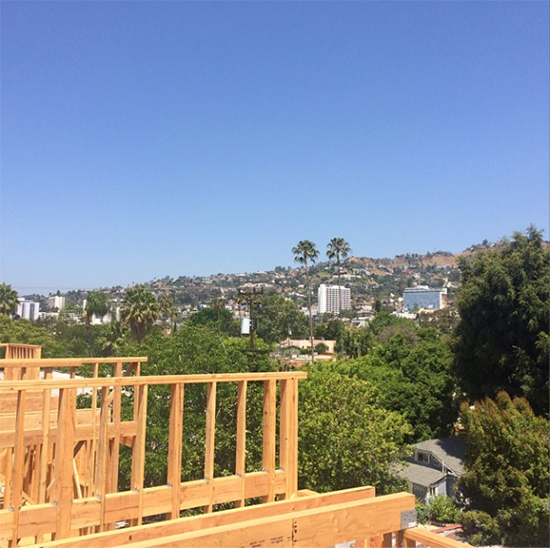 This 10-home small lot subdivision project is located in the Eagle Rock neighborhood of Los Angeles on Yosemite Dr. and takes its inspiration from the nearby Eagle Rock rock formation. Foothill Blvd. 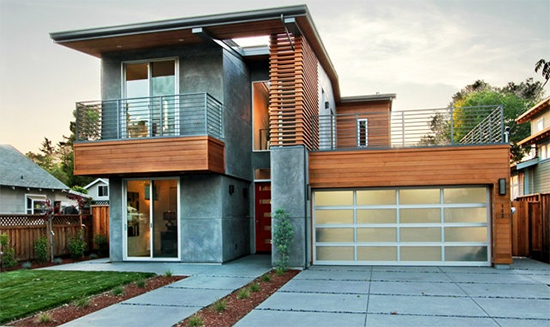 Live + Work is a 6-home subdivision in Cupertino. 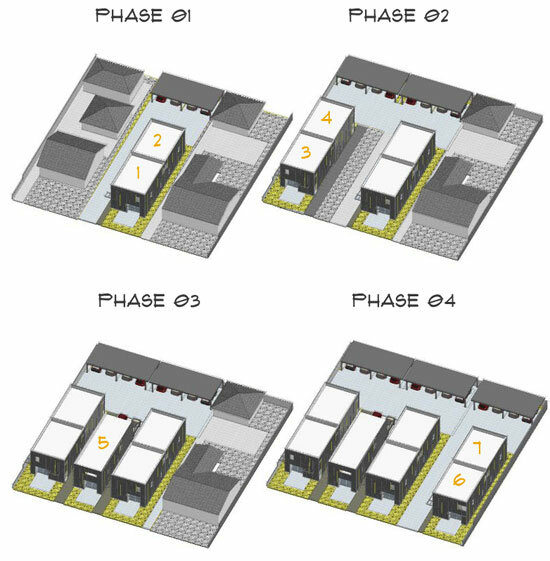 Our application for a zone change was approved in Septemeber 2014, changing the existing Commercial zoning to Commercial and Residential. This allows the current abandoned gas station to be redeveloped into six homes with office spaces facing Foothill Blvd. 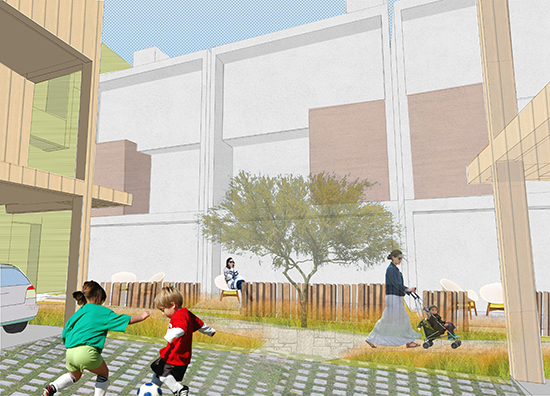 We submitted for permit at the end of 2014 and construction is expected to begin in 2015. Rendered view from Foothill Blvd. 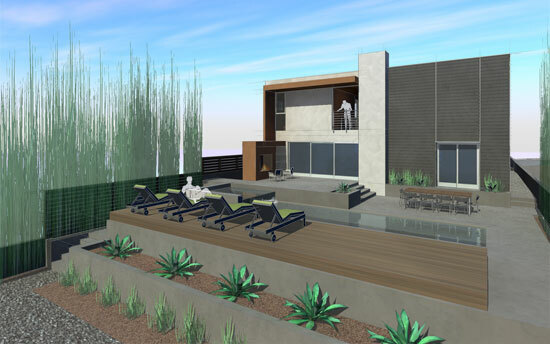 a. Alvarado is a 46-home project in Palm Springs, CA currently in Planning-approval stages. 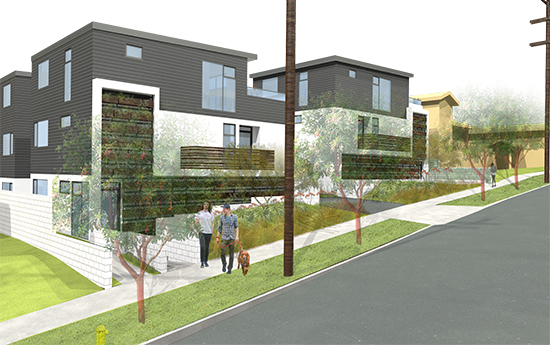 b. Hyperion is a 8-home small lot subdivision project in the Silverlake neighborhood of Los Angeles. It is also currenly in Planning-approval stages. 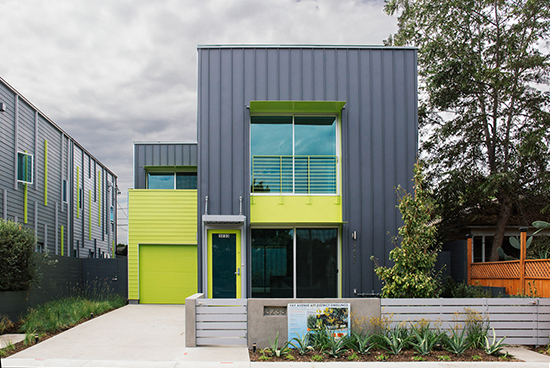 c. Ave 57 Art Walk Homes is Modative Develop's first project! 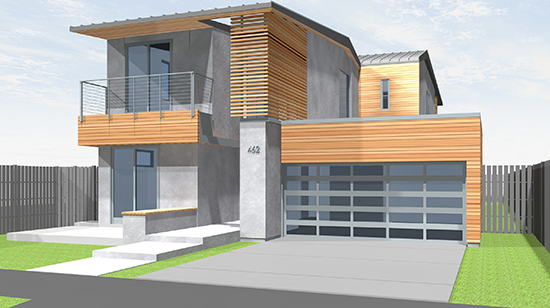 It is a 5-home small lot subdivision project in the Highland Park neighborhood of Los Angeles and is in the early stages of design. d. Edinburgh is a 8-home small lot subdivision project is just northwest of Fairfax and Melrose. It is in early design stages. 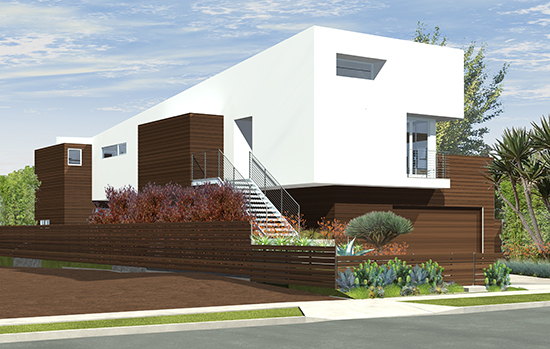 e. Flores is an 11-home small lot subdivision project is located southeast of La Cienega and Beverly. 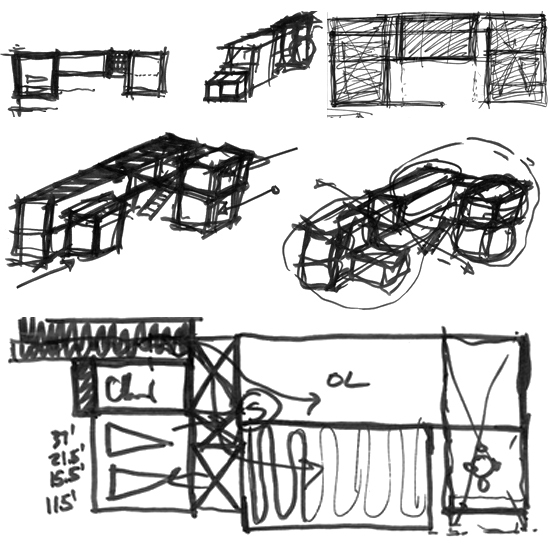 It is also in the early stages of design. a. Both Katherine Costa and Krystal Návar earned their Real Estate Sales Person License in 2014. Do I sense a fourth Modative company in the near future? 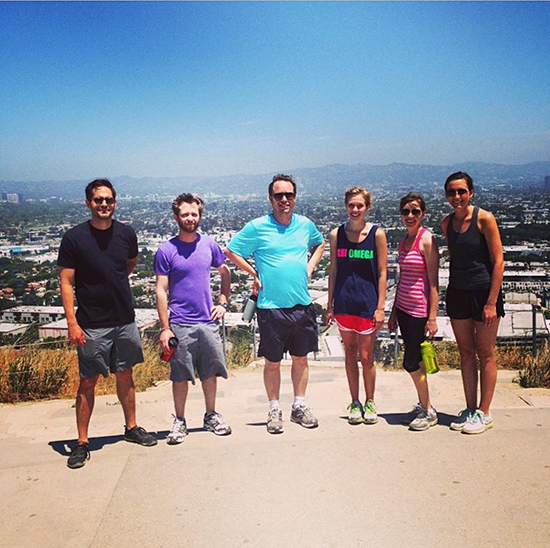 b. Modative began a Health + Wellness program in 2014, which encourages employees to live healthier lives by incentivising physical and mental respites throughout the week. c. Modative also began an Education program to encourage well-rounded professional development in employees. A stipend is granted to each employee to be used that year toward a personally valuable and professionally enriching activity. d. Summer, our Office Manager, and Jesus, a Project Manager, became engaged at the end of 2014. How exciting is that?! I mean, seriously. How cute! 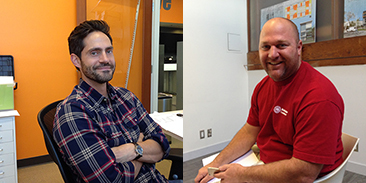 e. Modative Development, Inc., the third company from Derek + Christian, was born in 2014.
f. Modative and Modative Build hired six people in 2014. Brad Benefield and Steve Knight were brought on with Modative Build. Alan Dana was hired to project manage for Modative. Kenny Lee and Deborah O'Connell came on board as interns for Modative. And Stephanie Garcia was hired to assist Summer with office management duties. During a recent trip to City Hall, I stumbled upon pLAnning, the quarterly newsletter of the LA City Planning Department. 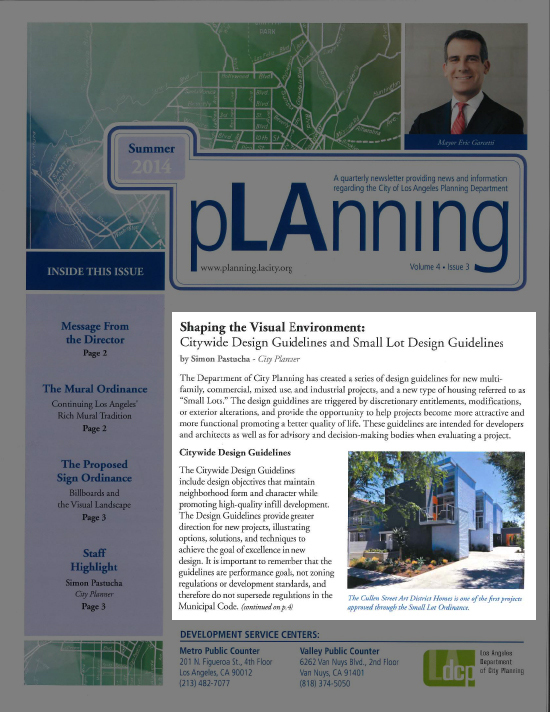 In this edition, Simon Pastucha, a City Planner with the Urban Design Studio, presents the City’s newly-issued Citywide Design Guidelines and Small Lot Design Guidelines. 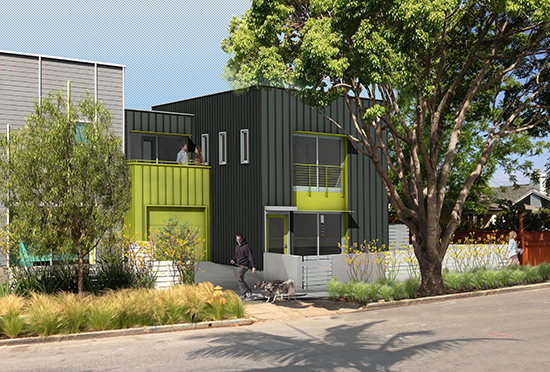 Both of the images included in the article are of Modative projects: The Cullen Street Art District Homes + Artis @ Echo Park! Modative contributed project images and participated in review sessions for the creation of the Small Lot Design Guidelines. In fact, both Cullen and Artis were featured on the cover. We are proud that two of our projects have been selected by the Urban Design Studio as being representative of thoughtfully-designed projects that contribute to the urban fabric of Los Angeles. 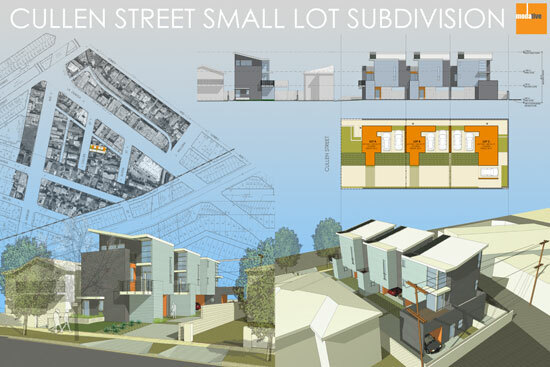 Modative has created our own Small Lot Subdivision Guide, a "how-to" for developers interested in Small Lot Subdivision. Check it out and contact us with any questions. 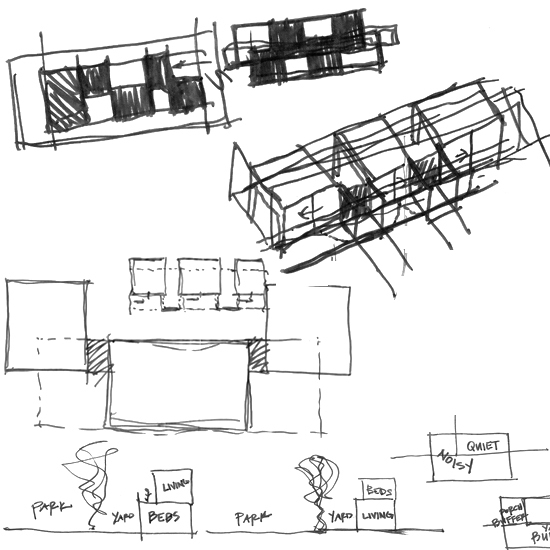 In our last post on the Roberts Avenue Residence, we took you through the schematic design process -- at least how our office goes about it. If you remember, the client picked Scheme A, which consisted of a series of shifting bedroom boxes on the ground floor, visibly and audibly sheltered from the neighboring park. The living level and guest bedroom were located on the upper floor, taking full advantage of the views over the park and beyond to Baldwin Hills. 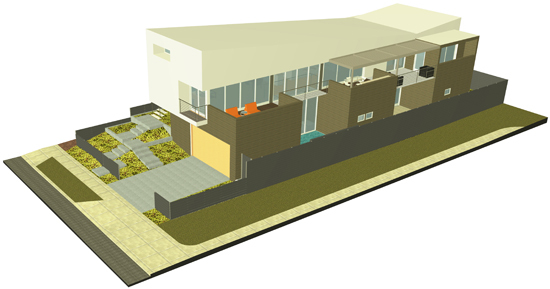 To refresh your memory, here’s an image of Scheme A during Schematic Design. You will see that the driving concept remains in the final design: quiet, spa-like spaces on the ground floor and open, airy spaces on the second floor. Although, there have been some adjustments. 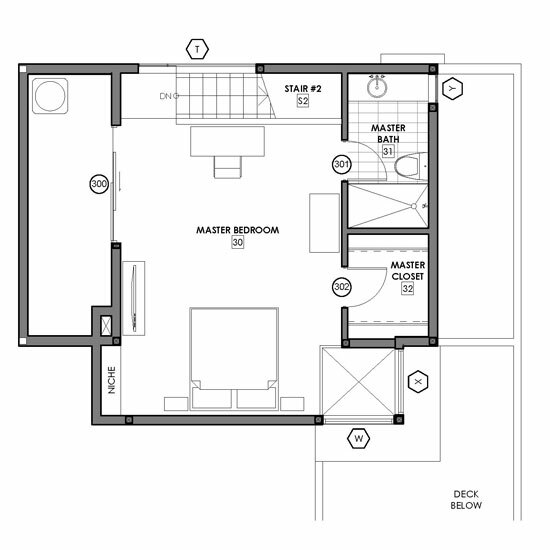 For instance, the guest bedroom and the master bedroom swapped locations. The client felt that the master bedroom, with it’s own private balcony on the second floor, would better benefit from the views. 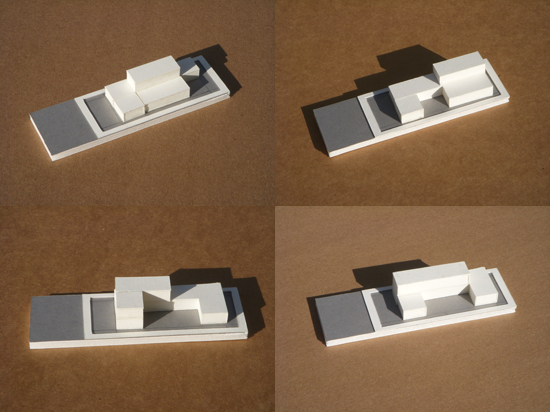 The bedroom volumes also shifted to alleviate the need for excessive steel structure to support unnecessary cantilevers. 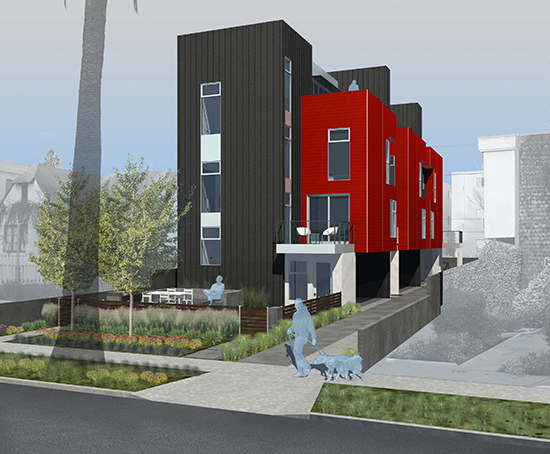 We have submitted for permits and are now waiting to receive comments back from the City. Once that happens, and we make the necessary corrections, bidding begins. Construction is expected to start by January 2012. Look for more updates to come with photos of the construction process. We are excited about this new project for two main reasons. First, we have been eyeing this triangle-shaped property for the entire five years our office has been in the area, long before it was even up for sale. (I was hoping it would somehow be left to me in someone’s will, but that would have been highly unlikely.) Second, this property is only four properties down from our Fay 2x Homes project. To have so many projects located within a mile radius of one another (in our own neighborhood, nonetheless!) 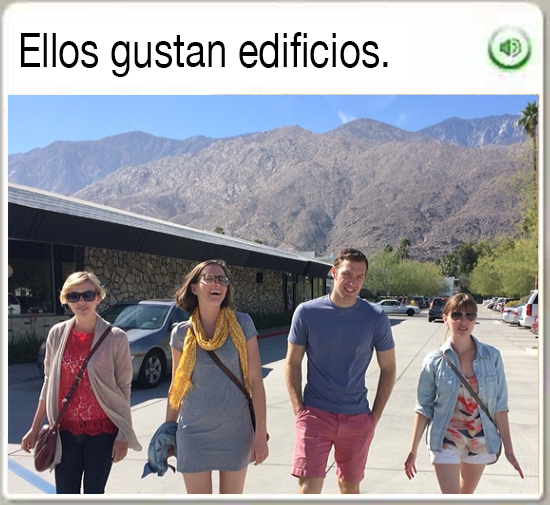 has been really special. We have the rare opportunity to inject this area with thoughtful, modern design. 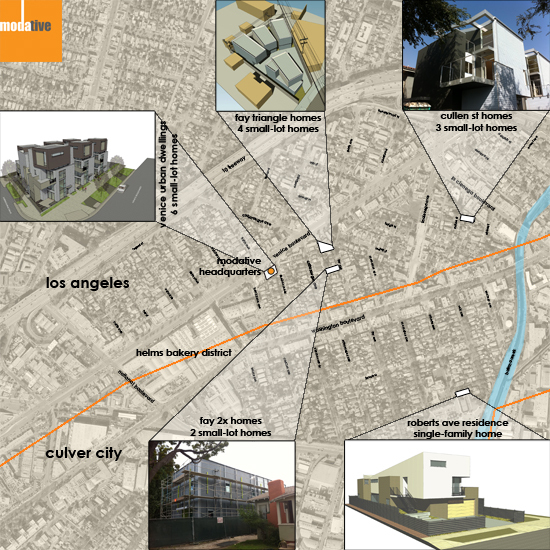 (Check out our other projects in the area: Cullen St. Homes, Fay 2x Homes, Roberts Avenue Residence, Venice Urban Dwellings.) Stay tuned for updates on this new project we’re calling Fay Triangle. 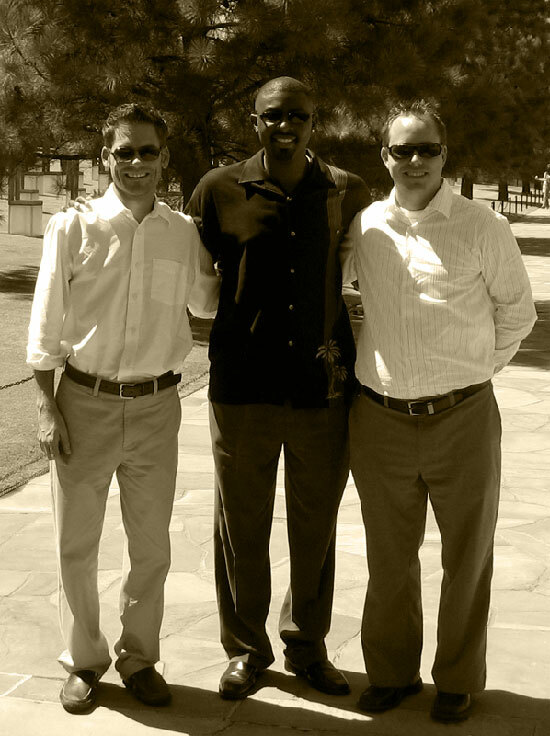 When Modative started in the Spring of 2006, we formulated a firm philosophy that included making modern affordable (and not just because the economy was about to tank). Our intention was to create a business operating structure that didn’t have to rely on generating income solely off of huge, elaborate commissions. Early on, we strived to create a firm that embraced projects of varying type and size, in order to satisfy our mission to make good design accessible to as many people as possible. So, if you call and say that you love good, modern design, but have a very limited budget, we will still consider the job. 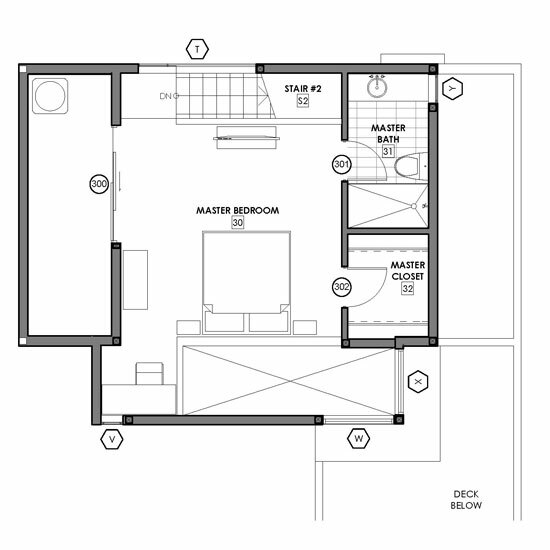 The project site consisted of an existing 1300-square-foot open loft space within a large multi-unit property. 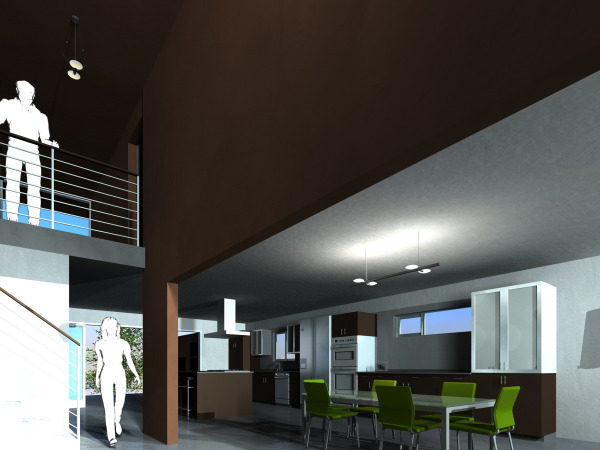 Our task was to take the hip, open loft space, and make it a bit more practical. 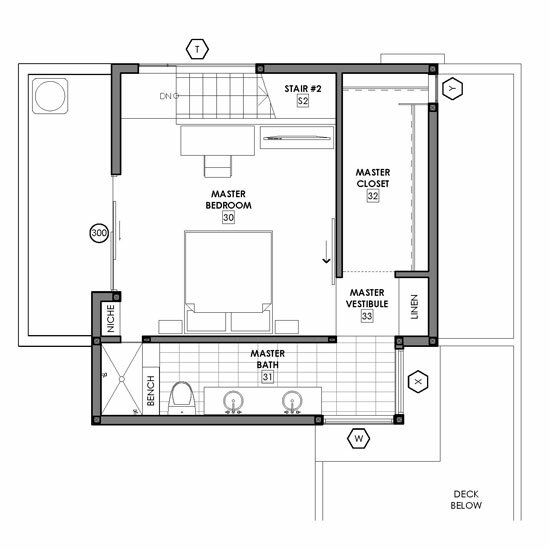 The Challenge: Split the open loft space, adding two bedroom areas, but maintain the “lofty” quality of the space. 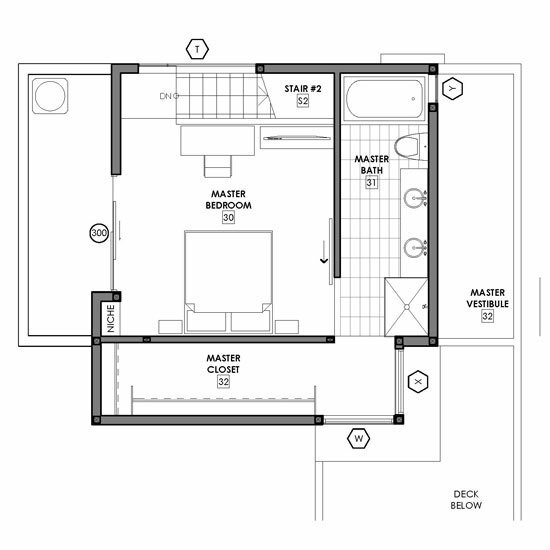 A wall was created to define the space between the living room and the bedroom/office area. Within the wall is much needed storage. 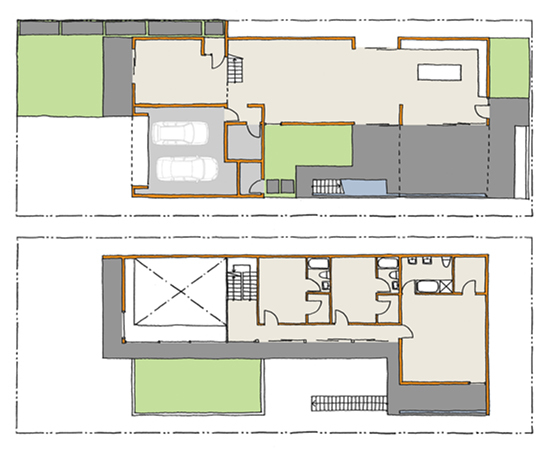 A new closet is accessed from the bedroom side of the wall, while a new pantry is accessed from the kitchen side. Within the new wall are a series of sliding, bypassing, pocketing barn doors. 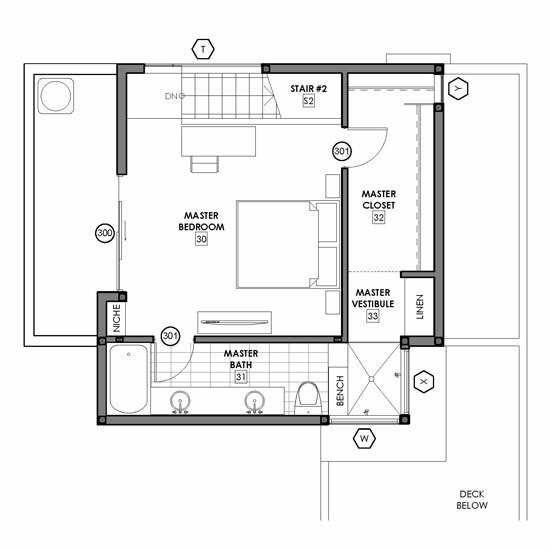 When closed, the 10’-0” tall doors provide privacy for the bedroom/office area. 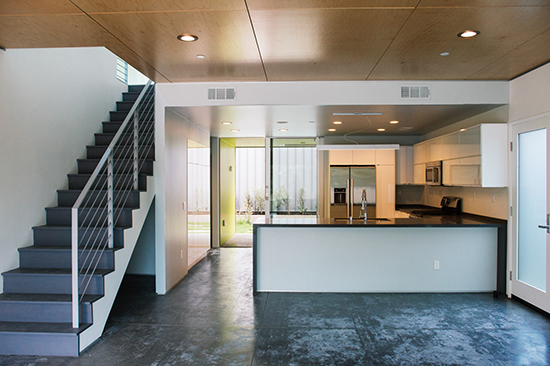 When opened, the large openings create definition, yet openness, within the lofty space. Post by Christian Návar. Contributors to this post include Krystal Návar, Derek Leavitt and Michael Scott . Spent too much on land? 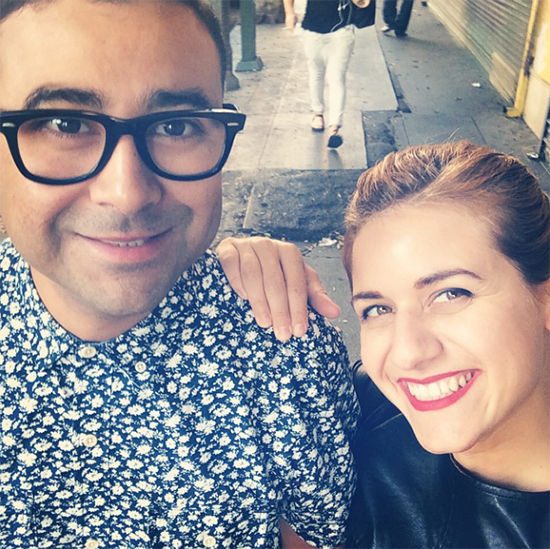 For years in our industry I used to hear how architects know close to nothing when it comes to staying on budget, that overspending is commonplace for most designers. With the severe downturn in the real estate industry it seems like architects finally aren’t the only ones who can be accused of overspending! 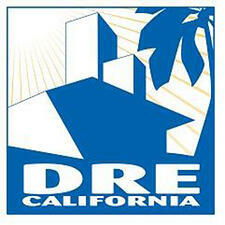 Like many Los Angeles architecture firms, many of our prize projects have been scrapped in the last couple of years. Our projects became victims of overspending, and this time, you can’t blame the architect for over-designing, ignoring budgets and having cost overruns. These days it is now clear that spending too much on land and planning oversized projects has become the real project killer. So, you bought too high you say? Now what? So, you bought a property at the height of the building boom and now your budget numbers don’t look so good and you need to put the project on hold? Hmm, if I had a dollar for every time I have heard that in the last year, Modative could bail us all out of this crisis. Being designers, we of course naturally believe that you can design your way out of anything. Here at Modative, we believe that if the government hired more designers, or real problem solvers, we would need less “financial experts” and definitely less slow-moving bureaucrats. If you think members of the Obama Administration are the only ones offering bailouts these days, you should check out our new 2-unit small lot subdivision “stimulus package”. 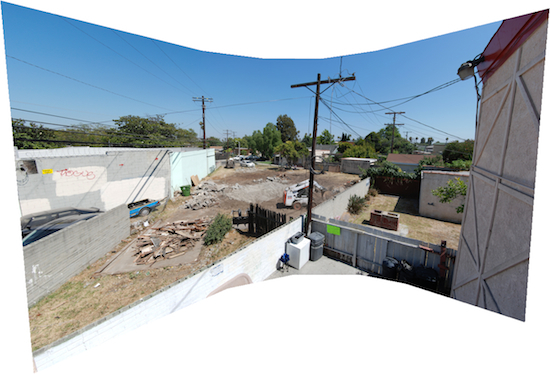 The project site is currently vacant land that sits between two other lots that combined were once part of a 7-unit small lot subdivision project on Fay Avenue in Los Angeles. After the economy crashed, the project was placed on hold, and our client found themselves with an overpriced and underutilized piece of dirt. In classic boomtown fashion, the original project consisted of seven luxury three-story units that were slated to be between 1,750 and 1,900 square feet each. 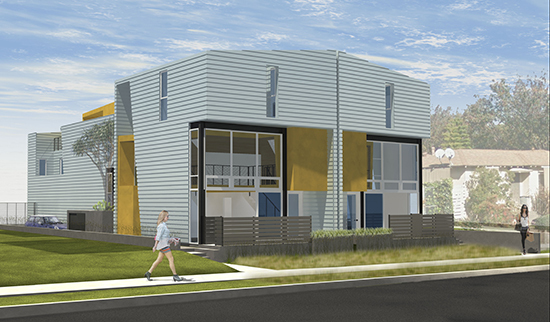 After the bust, the client asked us to reevaluate the site, specifically the vacant dirt lot, and propose a simple, cost-effective solution that would bring added value to this property which wasn’t generating any income. 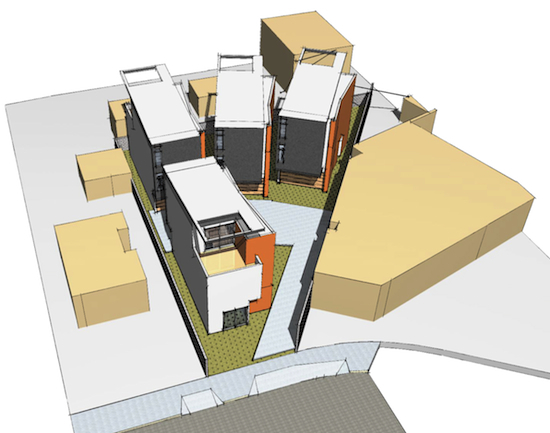 This isn’t our only revisited post-downturn, multi-unit housing project currently on the boards. In fact many of our recent projects have come to us as previously-approved condominium projects designed by other firms. 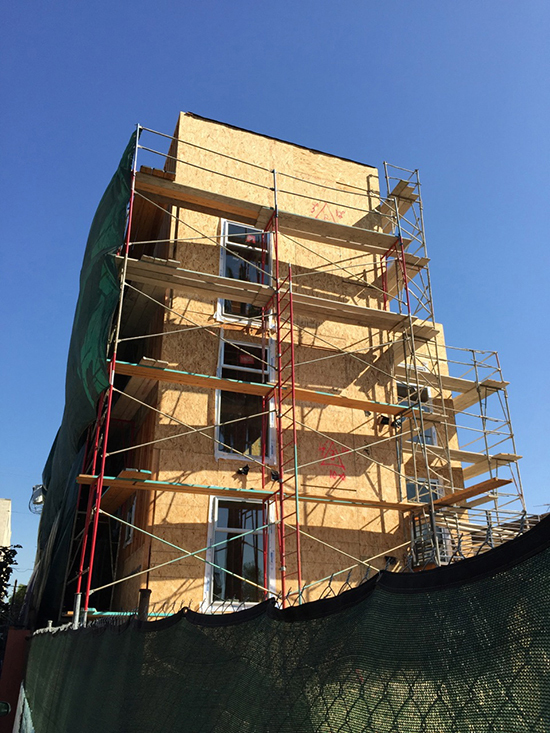 Aside from being asked to turn defunct condominium projects into small lot subdivisions, we hear the same thing over and over, how small can we make a residential unit and still have it be marketable? 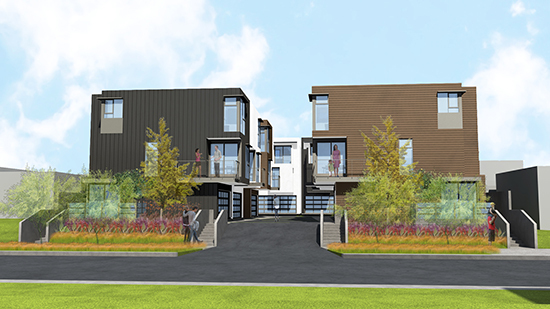 In the case of the Fay Avenue project, we proposed starting out with just two very simple two-story, 1,000 square foot, 2 bedroom, 2.5 bath units that could be offered at a price point more favorable in the current marketplace. 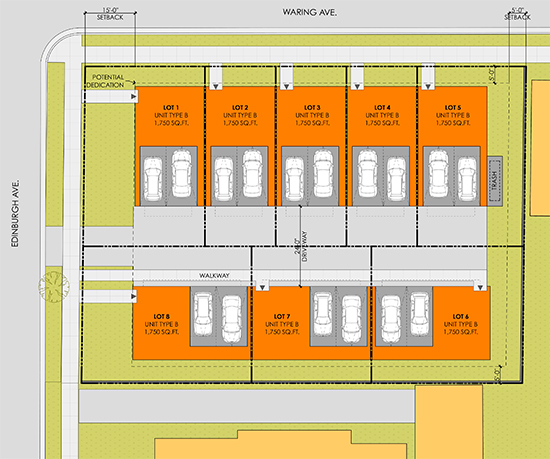 We then devised a creative phasing option, placing the proposed units on the site so that the owner could utilize the other two lots as part of a future phased expansion, that in the end will total 7 units. In the meantime, they could continue to rent the units on the other lots and wait for the economy and the current lending situation to improve. 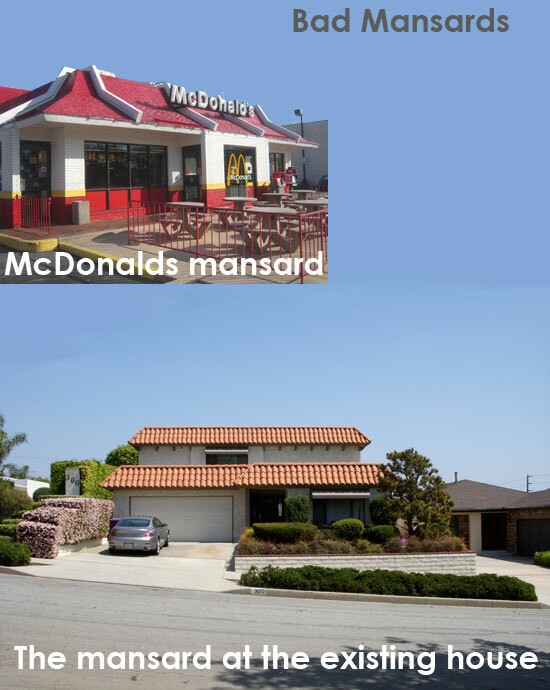 We have always believed in smaller units, but now, with the current state of the economy, we can finally get people to believe that bigger isn’t always better. We were proud of our original 7-unit project, but sometimes you have to cut your losses and move on. In the meantime, we’ll continue to take pride in knowing that our redesigned 2-unit “stimulus package” will help provide an added income stream for our client. An architecture professor of ours from USC once said, “I am teaching you how to solve problems, not so you will become good architects, but so you will become great politicians.” Well with the current unemployment rate in California hovering somewhere around 12.4%, anything Modative can do to be part of the solution is something to be proud of. We plan to post project updates on our website regarding this project, so if you’re interested, continue to check back for more info. Contributors to this post include Derek Leavitt, AIA, Michael Scott and Krystal Návar. You want them to succeed. You'd invest in their company if people were actually foolish enough to invest in architecture firms. Becoming a fan on facebook will be your investment. Becoming a fan of Modative Architecture now is like buying Apple stock back in 1996, days before Steve Jobs returned. If you did that back then, you'd now be a kagillionaire. So, joining the Modative train now will get you some serious internet clout when we get around to designing the architecture equivalent of the ipod. Hey, they seem like nice, upstanding citizens. I think I'll become a fan of their architecture firm. You can't wait to see them fail. You dislike them personally, their silly modern architecture and everything else they stand for. All great reasons to become a fan. It'll be like having front row facebook tickets to their demise. I don't know. 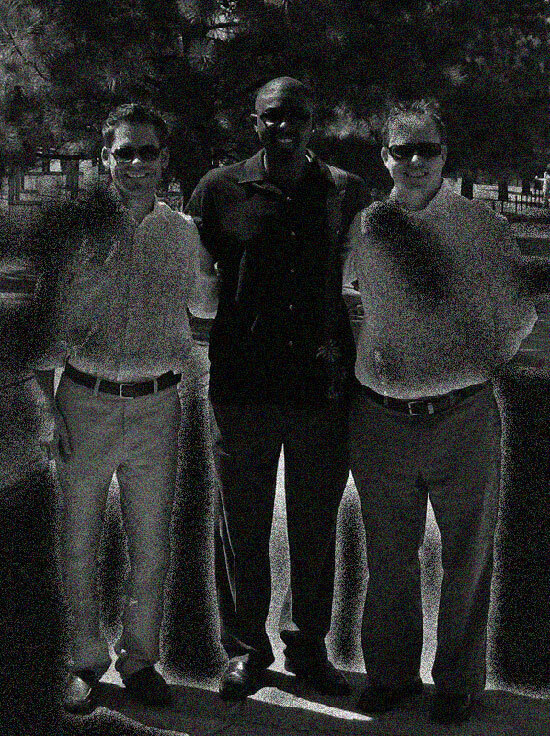 That's a pretty grainy political-ad-style photo. I can't wait to become a fan and watch their architecture empire crumble. Actually, you don't need culture. You need the appearance of culture. When your ex from high school finds you on facebook, they will dissect your profile, finding clues to the level of your lameness. Like it or not, you'll be defined by the pages on your profile. It could get ugly. But alas, there between the "Britney Spears Fan Page" and "Ground Beef Taco Lovers Club" they find a gem - "Modative Architecture". Bingo. Wow, my ex follows a modern architecture firm. That's some serious culture and sophistication. Little do they know, you consistently turn down invites to art gallery openings to stay home and watch bad reality TV shows in your underwear. You know your random facebook acquaintance with the horrible band. The one that asked you to become a fan of their group. You gave in. Big mistake. "Check out our new song on MySpace called 'Pig's Lair'"
"Vote for us like a bagillion times in this useless online contest"
"Come rock out with us at our Tuesday night gig at Malloy's in Salinas, CA"
At Modative we won't spam up your news feed. Why? because we're too busy drawing buildings and other important architecture stuff. Complex, technical stuff. We rarely update. And when we do, we'll be just as easy to ignore as the rest of your group/page updates. Craving more social media madness? Or, if you want the appearance of culture in your inbox, subscribe to this architecture blog to recieve an email every time we post. 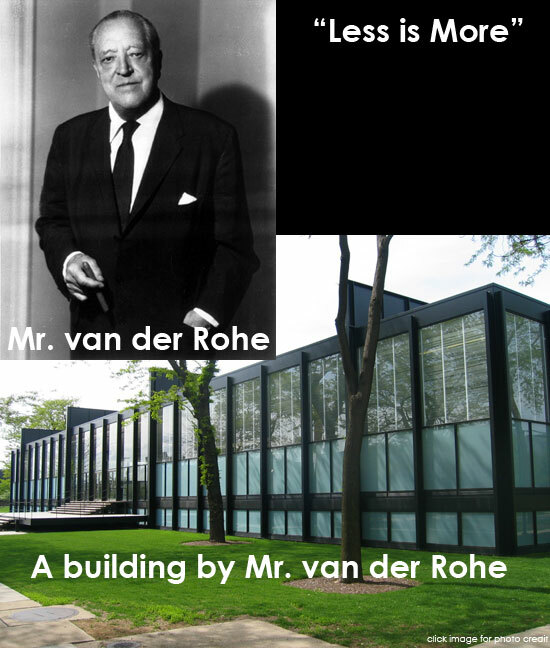 The famous saying is often linked to the architect Ludwig Mies van der Rohe, and drilled into every young student immediately after walking into the confines of just about any architecture school in the United States. 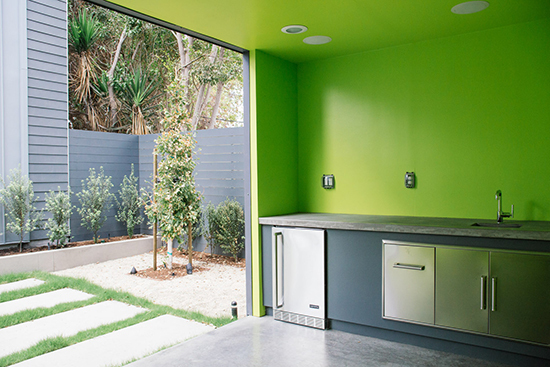 It is an important idea, but one overlooked (for unknown reasons) by the previous owner and builder of our client’s residence in Long Beach, California. Fortunately for modative, our client’s goals were perfectly aligned with this famous motto when we were asked to collaborate on a significant remodel of their single-family residence. "How about 'less' of just about everything? ", our client asked. Less maintenance, less underutilized bedrooms, less underutilized space, and definitely less terracotta Spanish tiles. What better way to start practicing Mies van der Rohe’s theories on minimalist architecture than to strip away the out-of-context Spanish tiles that adorned the top of the even more meaningless Mansard roof. 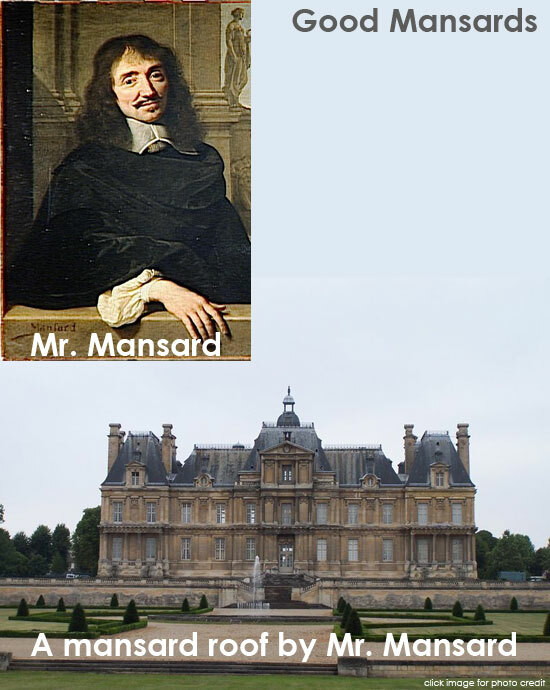 Yes, that’s right, I said it... a Mansard roof: a hip-style roof first popularized by French architect Francois Mansart who died in 1666! 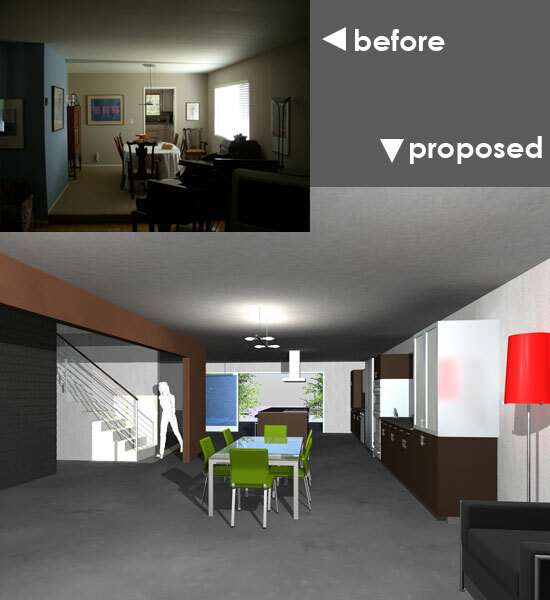 After redesigning the roof line, and adding a much more desirable (and functional...) Master Bedroom Suite, a thorough examination and reworking of the interior spaces was next to be considered. Inside, there were too many bedrooms underutilized since the kids had left the house. So recognizing the entrepreneurial spirit of our clients and their much-deserved desire to work more from home, a new work and loft space was created by combining the upstairs bedrooms and transforming them into the central focus of the expanded interior space. 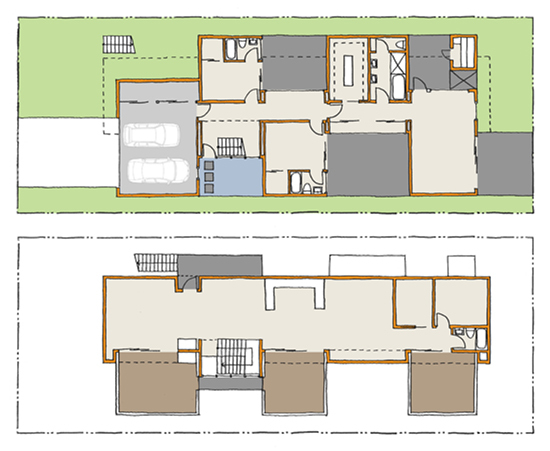 On the ground floor, we removed just about every interior wall (less compartmentalization ), and provided more of a connection to the outdoors by opening up the back wall to the large rear yard and newly proposed patio, pool, spa and garden. Goodbye, France... Hello, Long Beach. The 360 House will begin construction in Fall 2009. 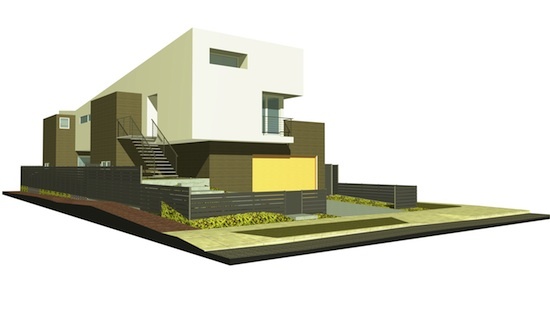 For more on this project, including a project blog, check out the 360 house project page.